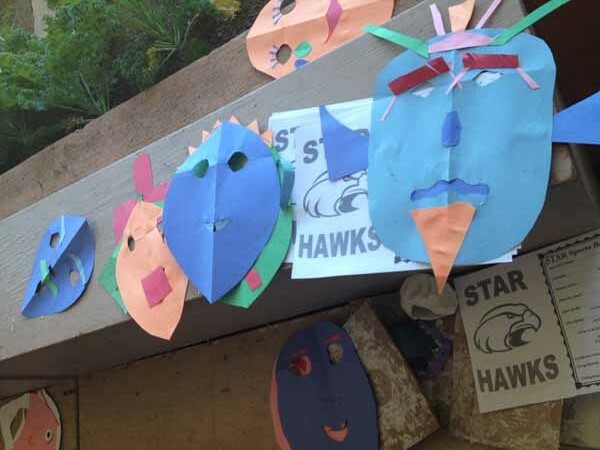 Earthaware has started work with the kids of the Navajo Nation at the supergreen charter STAR School near Leupp, Arizona. Our first contribution was aiding the renowned Zarco Guerrero from Mesa, AZ in teaching 50+ kids over two days of his week-long mask making and drumming classes. We learned so much from him right along with the wide-eyed kids. Zarco is best known for his incredible masks created in a variety of styles: traditional Japanese, Balianise, Mexican, Mayan, and more. The masks are meticulously carved and painted individually by Zarco. They are mostly made of paper, wood or clay. His creations have traveled the world in gallery and museum shows and are a part of numerous permanent collections. He is also a well known artist, sculptor, musician and is a dynamic speaker. Zarco has a fun, jovial nature... he became an instant brother to Earthaware. As a musician who grew up in a family of musicians he is equally qualified to teach music. At STAR School, which he teaches at every year, he brought hand drums of several sizes that he had made in Mesa for the week of lessons in drumming and mask making. During the drumming section the students learned different beat progressions and how to off-beat each other, how to lead and follow and how to dance to the beats. The sequences were partially derived from Navajo Pow-Wow ceremonies and several kids not only danced but chanted to the drumming as they are accustomed to hearing and doing in the Navajo Nation. The second day was mask-making. Zarco worked with simple materials: colored paper, scissors and white glue. He led all of us in a sequence of folds and cuts to our 8 1/2" x 11" sheet of paper to form a face shape with openings for eyes and a mouth. We look forward to the next opportunity to work with the amazing Zarco: the Earthaware invitation is out to him to join us somewhere, anywhere... on the planet Earth for a co-creative workshop where mask making, drumming and plain ole fun is being had!